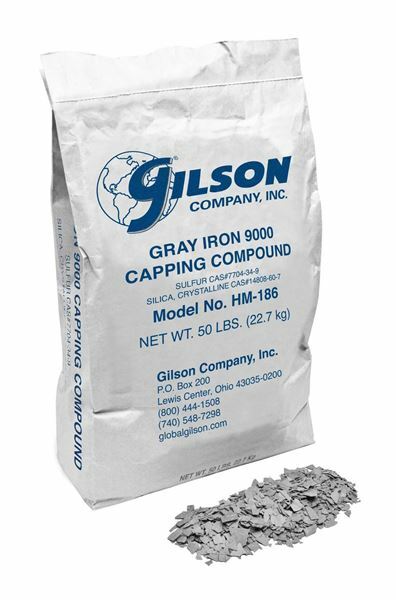 Gilson Gray Iron 9000 Capping Compound is a new and improved sulfur mortar capping compound that ensures even load distribution during concrete strength testing. Ultra-thin, low-odor flakes are carefully formulated from sulfur and mineral filler. Gray Iron melts quickly at 230°—240°F (110°—115°C), with a wide optimum pouring range of 265°—290°F (129°—143°C). Set time is about one minute, and shrinkage is minimal. If accidental overheating occurs, the compound remains usable after cooling, and solidified material can be re-melted with no loss of properties. Compressive strength exceeds 8,000psi at two hours for ASTM C617 tests of 2in cubes, and bond strength is 150psi or more. Strength and bond properties of capped specimens does not degrade over time, even when stored in humid conditions. Bags are 50lb. Order 40 or more bags for value price option.